Soe Hok Gie is an activist who lived in the sixties. 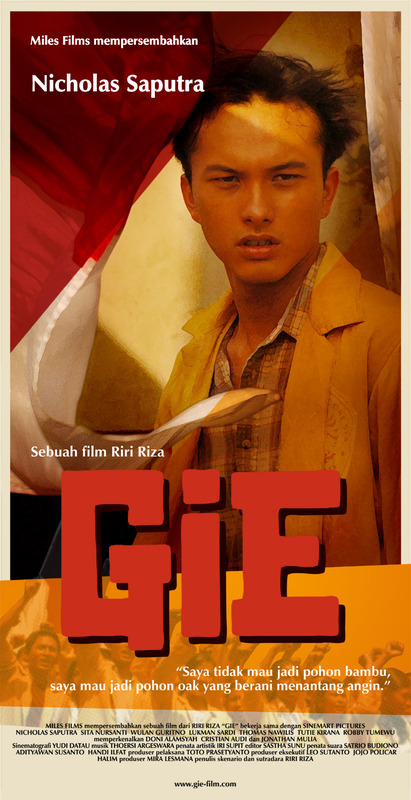 Set in the darkest era of Indonesian modern history, GIE is an interpretation of what happened based on his journal. He is a history student when his world stretches between politics and personal life. A critical young man, he sounds his great concerns about his collapsing nation. Yet, he is sensitive and romantic. He loves to explore the mountains, to admire the great beauty of nature. His life is a clash between the high drama of national political events and the small world of friendship and romance. He is falling apart when he sees that his constant battle for justice and truth gives labor to another dictatorial regime, and caused the massacre of millions suspected communists, including his childhood friend. He continues to fight but his uncompromised idealism drives people away. His best friends left him. The woman he loves rejects him. From time to time, nature is a place where Gie finds peace and it’s where his life comes to an end. Gie dies on the summit of the highest mountain in Java, just a day before his 27th birthday.